The organ was until recently in the United Reformed Chapel of St John’s, The Green, Buckley in Clwyd. It was moved there in 1902 from Grafton Square Congregational Chapel in Clapham. The organ was supplied to ‘Clapham Congregational Church’ in 1852 by the well known London organ builders, Gray & Davison. They rebuilt and enlarged it in 1879-80, altering the appearance. It seems to have remained unaltered in 1902. In 1947 Whiteley of Chester carried out repairs, and supplied a Tremulant, pneumatic action to the Pedals, a new pedalboard and a balanced Swell pedal. 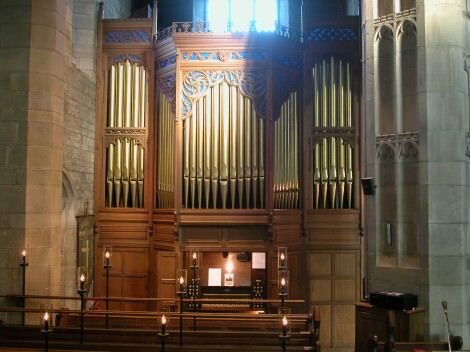 In 1998-9 we have moved the organ and restored it. The organ uses the case front from the original organ in the 1913 Austin and Paley church at St Anne’s, which has an unaltered interior. The organ it replaces was a 1913 Brindley & Foster, made for the church, though unfortunately with pneumatic action and direct pallet chests which none of the firms asked to tender were prepared to restore. Only now, for the first time, will there be front pipes. The organ at Buckley had a simple piperack, though parts of the 1852 case survived inside the organ. The organ fits the space exactly, apart from the pedal organ, which occupied a great deal of space at the sides. The original pedal chests have been used, but the opportunity of restoring the mechanical key action has also meant that these chests could be disposed to fit the new site. Otherwise, the organ has been restored in the state in which it was found.